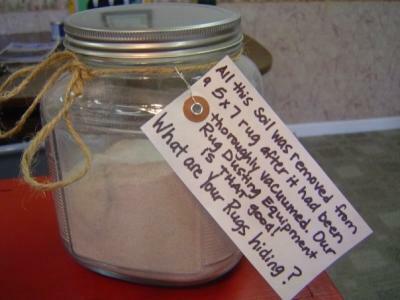 This video shows how dry soils are removed from a rug with the Badger tool before it is washed. Russ has placed the rug over a metal grate so the loosened soils can fall away from the rug. The Badger is then drawn over the rug, vibrating the dry soils out of the rug. Not all rug cleaning companies have this equipment, but they should. Regular vacuuming can't compare. When you bring your rugs to Rug Rehab, at Steamway Craftsmen Cleaning Services, in Ames, Iowa, you can rest assured your rugs are getting clean. Here’s a picture you may have seen on our site. This is what we removed from a 5’ x 7’ rug, after it had been thoroughly vacuumed! Bring your rugs into Rug Rehab at Steamway Craftsmen at 1602 E. Lincoln Way, in Ames, IA, to get them looking new again! Call us at 515-232-8938.